Like many farmers in Southside Virginia, the Jones family had been growing tobacco since the 1700s, but all of that changed three generations ago when Ray Jones came back to the farm after spending some time in Tazewell, Virginia. 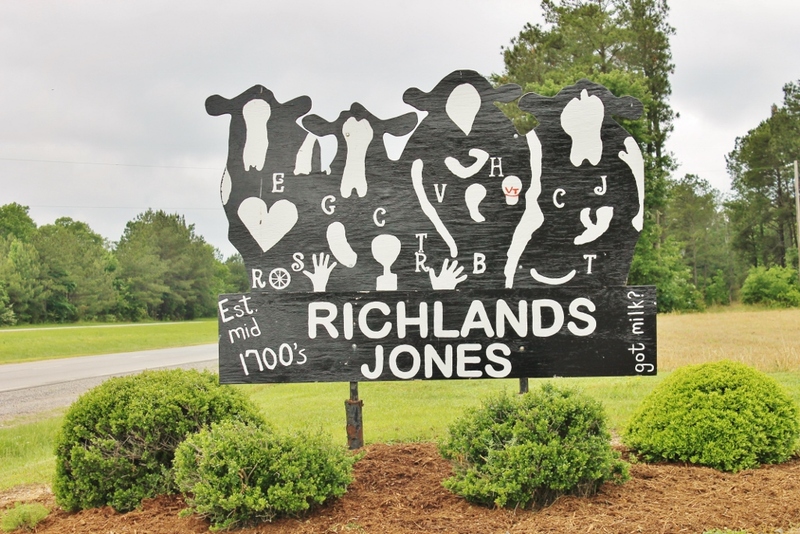 He renamed the farm “Richlands” after a town in that county and decided that dairy farming was the future of the family. Ray still lives and works on the farm with his wife, Shirley. Today, he is joined by his son Hugh and daughter-in-law Tracey, along with his granddaughter Coley, grandson Thomas who graduated from Virginia Tech’s Dairy Science program alongside his wife Brittany, and several other members of the Jones family. Located in Blackstone right along the county line between Dinwiddie and Nottoway, the farm is one of few remaining in the region. 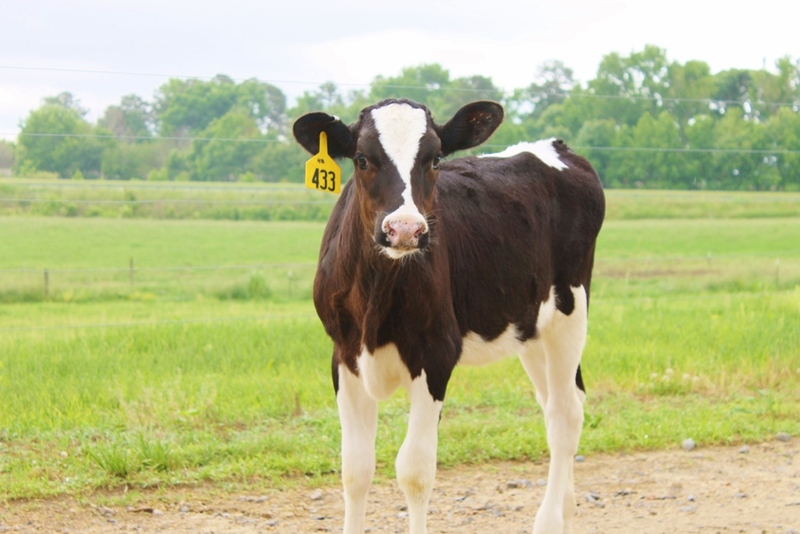 Most of Virginia’s dairy production takes places in the Shenandoah Valley, west towards Franklin County, or down in Southwest Virginia. Nonetheless, Richlands shares some common traits with dairies in these more distant areas. The milking herd consists of about Holstein 230 cows. 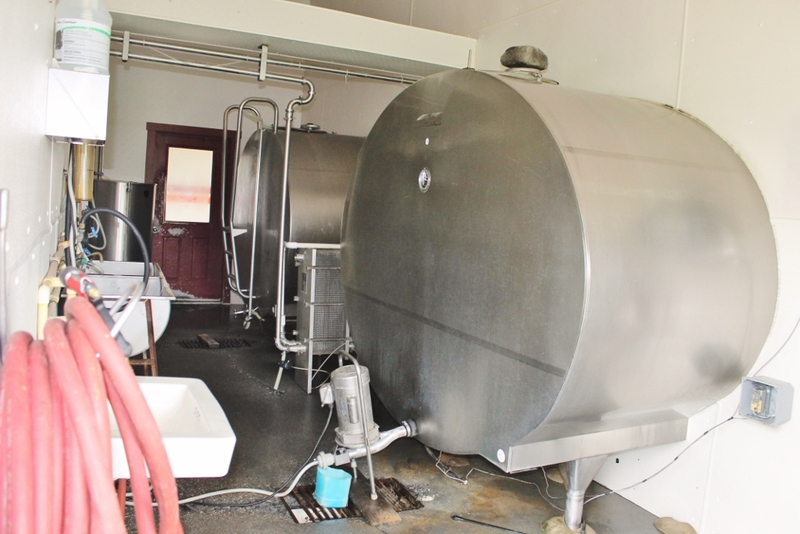 The farm now milks twice a day like most other producers, although at one time the cows were milked three times per day. Cow line up to get milked on both raised sides of the parlor; the milking staff stands at eye level with the machines while they are on the cow (above). Unlike most parlors, some of the milking system is housed in a basement below the parlor (below). The milk is cooled and stored temporarily in a bulk tank before pickup (bottom). 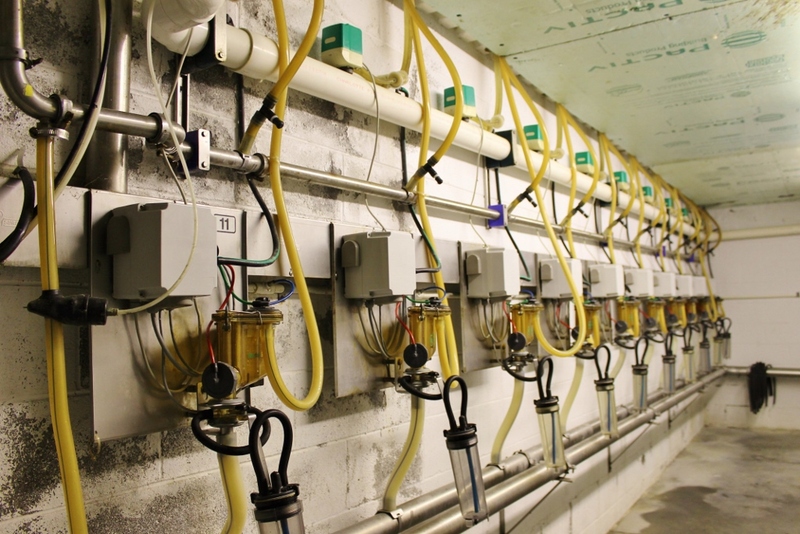 Unlike most dairies, parts of the parlor’s milking system are housed in a basement below the parlor, making for a much quieter milking experience for the cows and farm staff working upstairs. 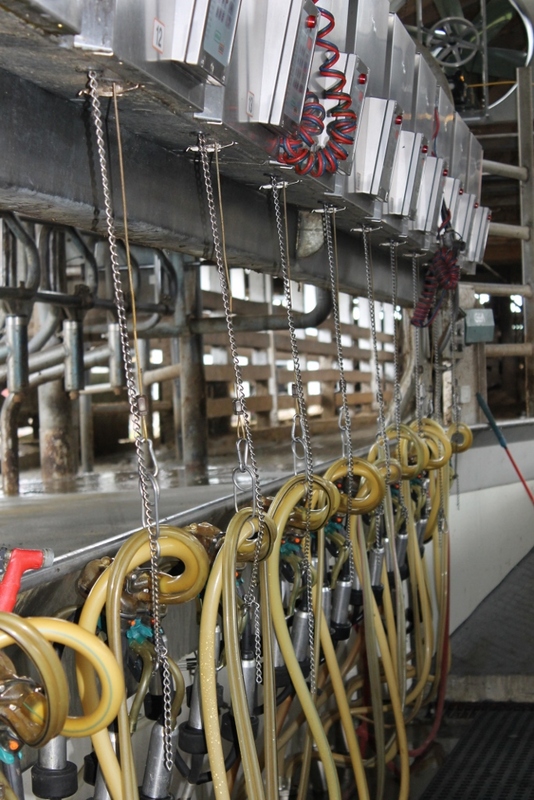 Cows that are brought in for milking only spend ten minutes or less with the machine attached before milking is completed and they are able to walk back to the barn to eat, drink, rest, or socialize. Cows may freely choose to walk to this end of the barn to eat the ration that is delivered to them. The barn for the milking herd at Richlands is also rather unique. 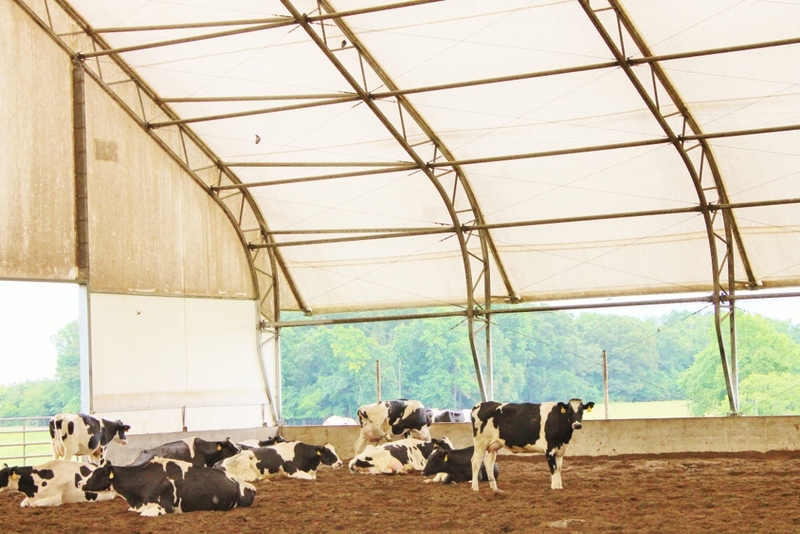 In contrast to a traditional barn which is usually long with open sides with one or two long feed alleys and a middle row of raised stalls with dividers where cows can lie down, the “pack barn” at the farm consists of a high, light roof and a large, open, rectangular bedded area where cows can lie down to rest wherever they please instead of choosing an individual stall. The cows are walked from the barn to the adjacent parlor area at milking time. 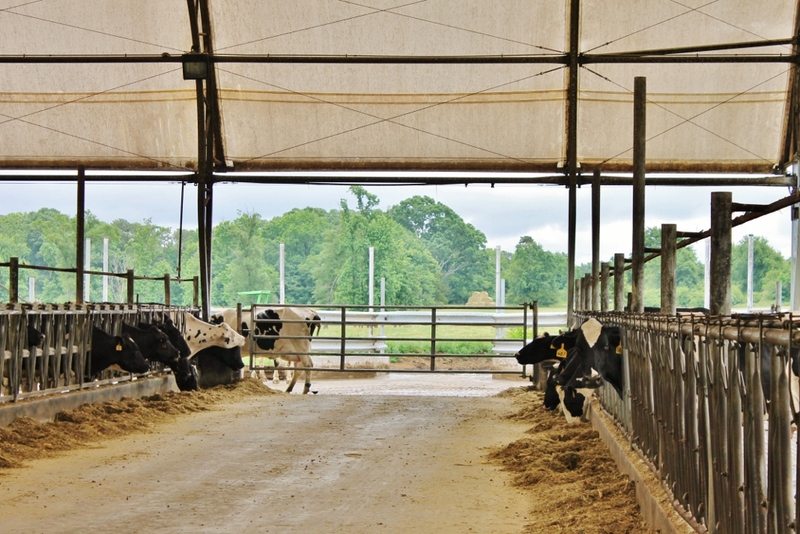 To eat, the cows walk to the feed aisle, stick their heads through an opening, and eat a mixture of silage, hay, grain, and other feeds that is specially formulated with the help of a dairy nutrition consultant. Ration formulation for milk cows requires precision and a deep understanding of digestive physiology and animal nutrition. Too much or two little of certain nutrients can cause the cow to drop in milk production, lose weight, or get sick; too many unnecessary ingredients can drive up costs. This handful of “TMR,” or “total mixed ration” for the cows, primarily contains forages such as corn silage and hay. Grain and other feeds may be added to create a balanced diet that meets the nutritional demands of a lactating cow. The consultant helps the farm keep the ration in balance while juggling changing ingredient availability and costs. 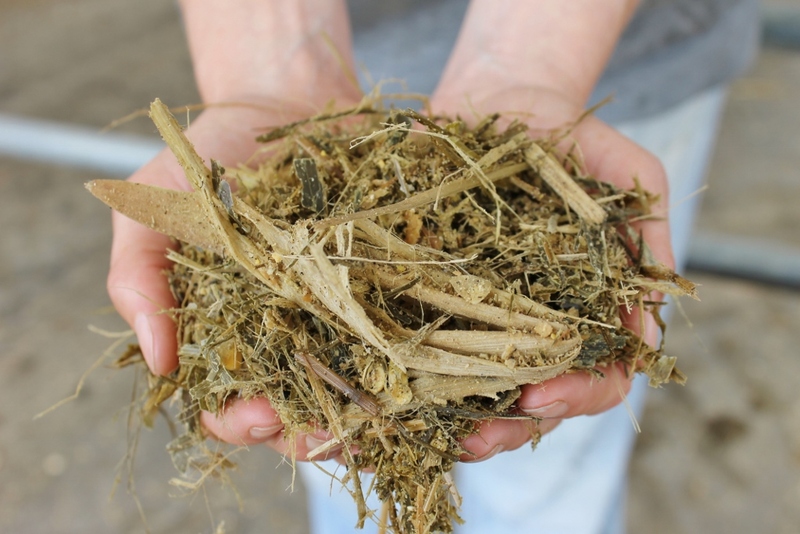 Main ingredients like corn silage, hay, and triticale are grown on the farm. 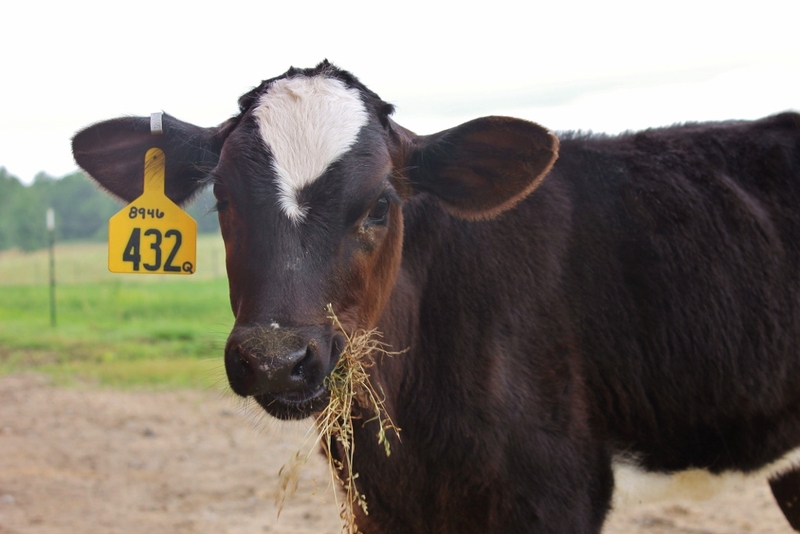 Sometimes the ration can contain ingredients like soybean meal, beet pulp, or brewers grains, which result when raw grains and other items are processed for other purposes, but these “by-product feeds” are excellent sources of nutrition for cattle and have the added benefit of preventing waste. 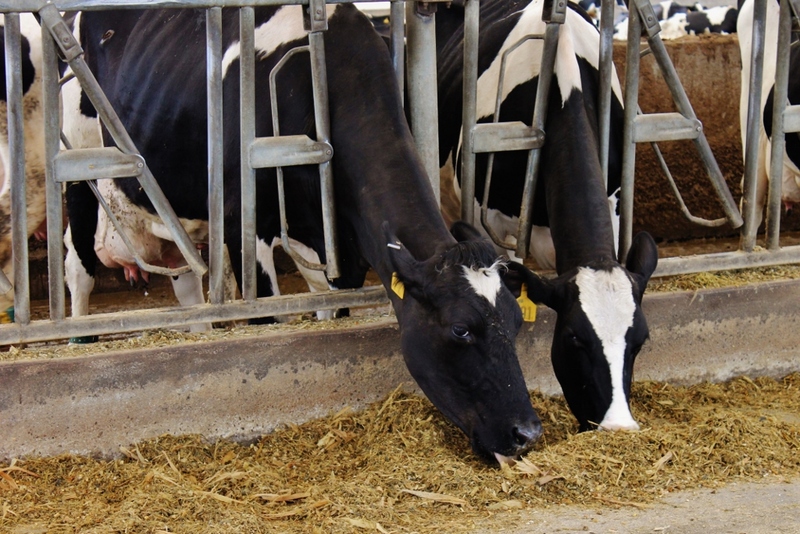 Contrary to the belief that milk cows are only fed grain, cows require a high level of forage in their diets, some of which they obtain from corn silage and hay in their feed and some of which they eat when they are let out to graze on available pasture. The growing heifers, which will join the cows after they are old enough to have calves, spend nearly all of their time grazing, as do the “dry cows.” Each cow at Richlands is given a “dry” period of about two months during which she is not milked. This gives her udder a chance to recover and rebuild and allows her to rest as she prepares to have her next calf so that milk production begins again. When a calf is born at Richlands, caretakers ensure that it receives colostrum, the first milk containing antibodies from the cow, within a few hours. 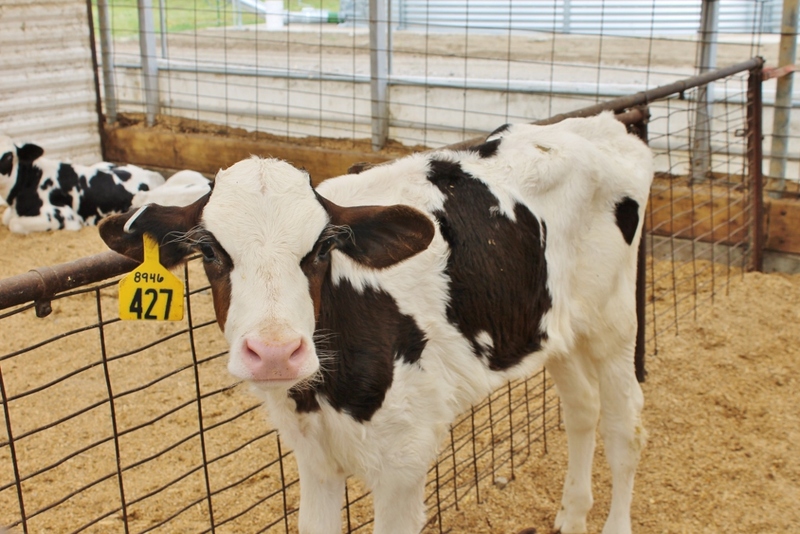 Although some farms opt to keep calves in stalls or hutches with individual exercise areas, Richlands uses a group housing system where all of the calves eat, rest, and socialize together in large pens. 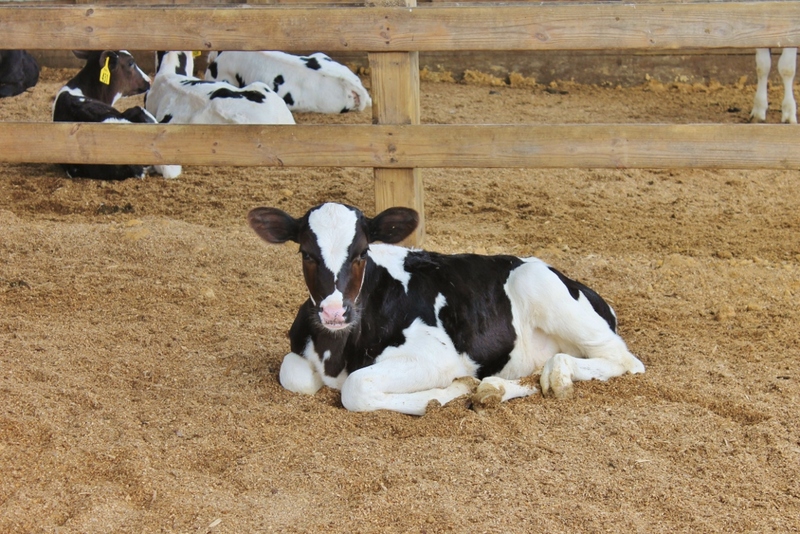 The calf barn is kept clean and freshly bedded to reduce the chances of disease. 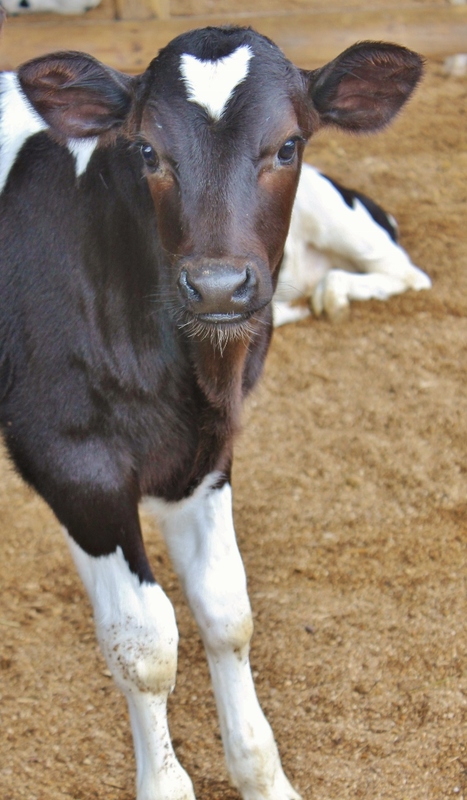 Calves are very curious and quickly learn to recognize that humans are the bearers of milk. 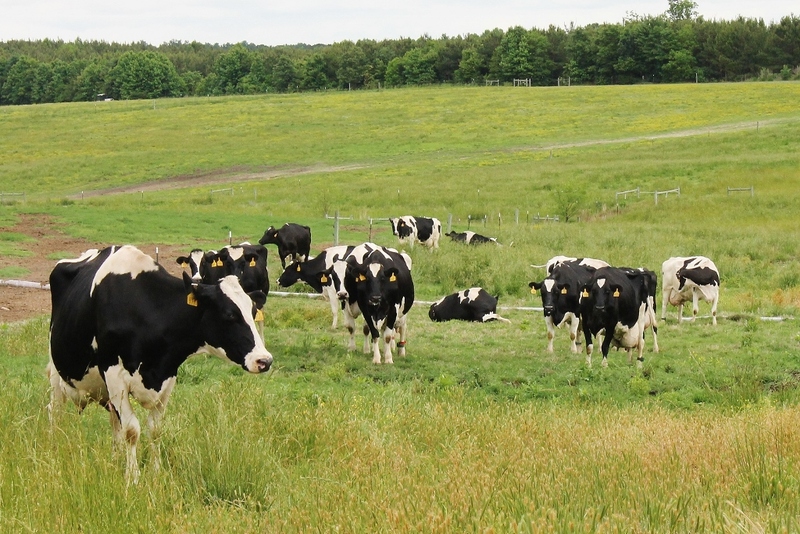 As they grow larger, they learn to eat forages and grains and eventually transition to a new area of the farm where they are able to graze with other older heifers. To increase efficiency and enhance the effectiveness of their calf nutrition program, the Jones family is considering the possibility of using an automatic feeder in the calf barn that tracks and regulates each calf’s consumption and allows them to drink multiple times throughout the day. 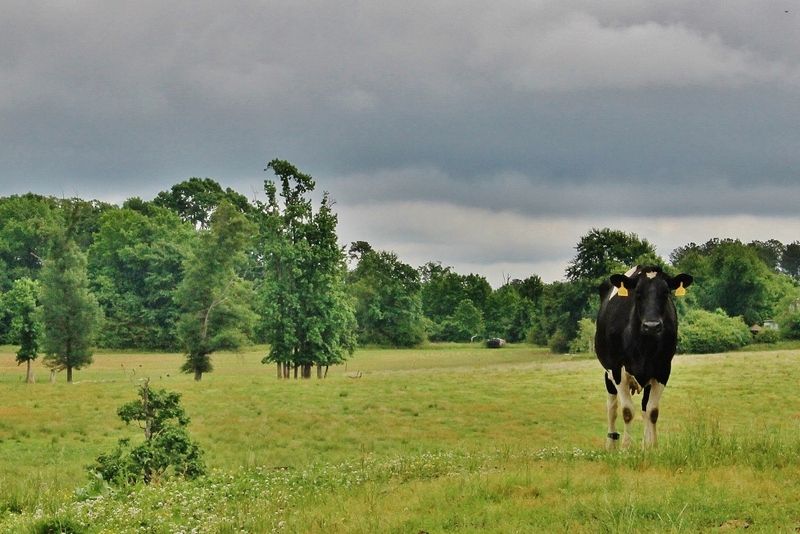 In a region of Virginia dominated by soybean, wheat, barley, beef cattle, and tobacco production, dairying has become rare. 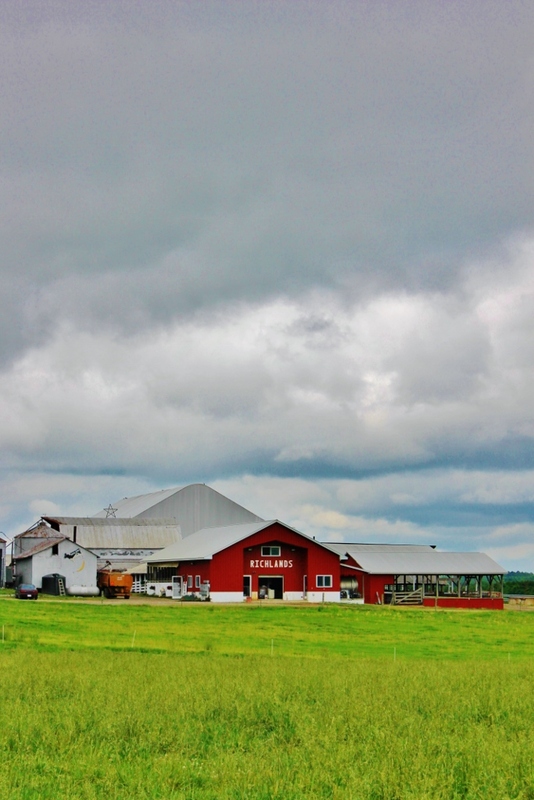 It is even rarer to find a dairy that has adapted to changing times and changing technologies like Richlands has. 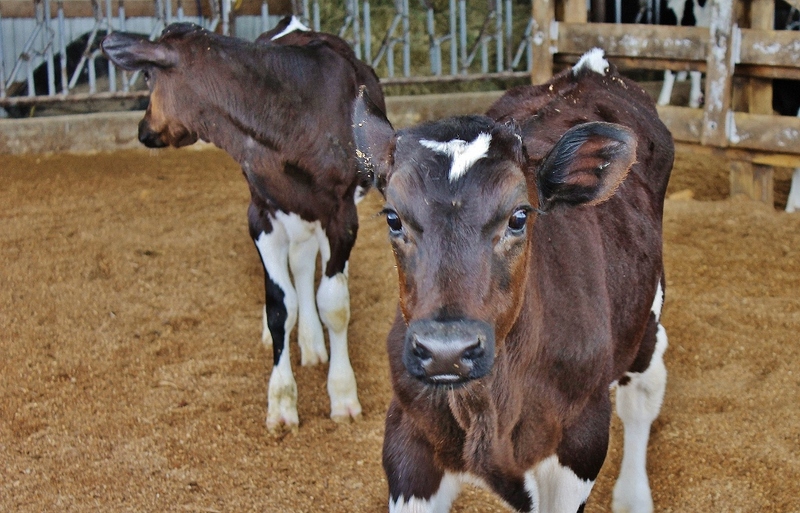 The family has also willingly become a knowledge resource to the community in recent years by allowing students to visit for field trips and loaning out calves for agricultural education events in the area, and the farm employs some local teenagers who are able to gain valuable work skills. Ray’s original dream for his family when he returned to the Virginia farm was right on track. Dairy really was—and is—the future for the Jones family, and anyone who has met them can see the legacy they are creating. But even to passing drivers on 460 who will never meet Ray, Shirley, Hugh, or anyone else from the farm, the cutout wooden farm sign in the shape of Holstein cows on the end of the driveway serves as a reminder that the food in the grocery store comes from families across the state who have a lifelong passion for farming. Great article about my family’s farm! It was a fantastic place to grow up, and I love returning there. I’m so thankful that my brother’s family, and my mom and dad have kept it thriving all these years! Thank you! You have a wonderful family! Hi! Long time no see hear or hear tell of … Glad to know your family and the farm are still making it. I have wonderful memories of a childhood spent growing up on this farm with 4 siblings and Godly parents. So thankful for the hard work of my parents, brother Hugh, his wife Tracey, and their family which allows the dairy to survive. Still a favorite place for all of us with our children and grandchildren to gather. Neat! It sounds like many members of the family are really proud to have been raised on such a neat operation, and you all have worked very hard along the way! Loved reading about this wonderful dairy. We used to live about a mile north of there and visited many times. We watched all of the family grow and worshiped at Grace UMC down the road together. Wonderful memories. taken to maintain the professional look it has. Yes, I think it is incredibly important that people passing by see such a nicely run and well-maintained operation. That may be the closest some get to actually visiting a dairy farm! Thanks for reading! Thanks for reading the blog! I’ve always enjoyed seeing all the cows grazing when I pass by, too. Thank you, Tom, for the thoughtful post and memory! I will be certain to pass it along to the Jones family.